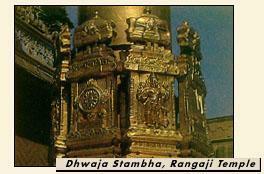 The Rangaji Temple, built in 1851 is dedicated to Lord Ranganatha or Rangaji depicted as Lord Vishnu in his sheshashayi pose, resting on the coils of the sacred Shesha-nag. The temple built in the Dravidian style has a tall gopuram (gateway) of six storeys and a gold - plated Dhwaja stambha, 50 feet high. A water tank and a picturesque garden lie within the temple enclosure. The annual festival of Jal Vihar of the presiding deity is performed with great pomp and splendour at the tank. The temple is also famous for its `Brahmotsdav' celebration in March-April, more popularly known as the `Rath ka Mela'. The ten day long celebrations are marked by the pulling of the rath (the chariot car) by the devotees from the temple to the adjoining gardens. 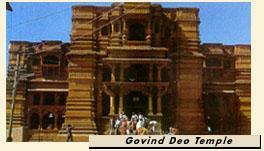 The Govind Deo Temple was once a magnificent seven storeyed structure built in the form of a Greek cross. It is said that the Emperor Akbar donated some of the red sandstone that had been brought for the Red Fort at Agra, for the construction of this temple. Built at the astronomical cost of one crore rupees in 1590 by his general Man Singh, the temple combines western, Hindu and Muslim architectural elements in its structure. The Shri Krishna-Balram Temple built by the International Society for Shri Krishna Consciousness (ISKCON), is one of the most beautiful temples in Vrindavan today. The principal deities of this temple are Shri Krishna - Balram and Shri Radha - Shyam Sundar. 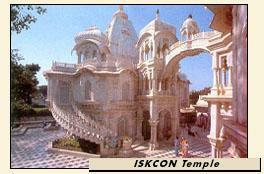 Adjoining the temple is the samadhi of Shri Prabhupada, the founder of the ISKCON sect, built in pure white marble. Other places of interest include the Sriji Temple, Jugal Kishore Temple, Kesi Ghat, Lal Babu Temple, Raj Ghat, Meera-Bai Temple, Imli Tal, Kaliya Ghat, Raman Reti, Varaha Ghat and Chira Ghat. The Seva Kunj is where Lord Krishna once performed the Raaslila with Radha-Rani and the gopis and Nidhi Van where the divine couple rested. The samadhi of Swami Haridas is situated here.